What Would You Do As The Boss? I read an article in the Wall Street Journal yesterday titled, “Where’s the Boss? Trapped in a Meeting” by Rachel Emma Silverman. The article talked about a study that was done on CEOs. London School of Economics and Harvard Business School did a study of over 500 CEOs from various companies around the world. The studies were done to see how they used their time. The results were tracked by the CEOs’ personal assistants for anything the CEO did for more than 15 minutes during the day. Some of the results were very interesting. 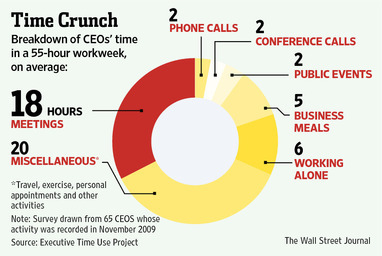 The average tracked CEO worked 55 hours a week and spent 18 hours in meetings. As you aspire to be a great leader, you may see the graphic above as a projection of what your life might be like. CEOs spend roughly 33% of their time in meetings. CEOs spend a lot of time in meetings because they constantly have to report progress of the company and they are required to coordinate with others. They also have a lot of responsibilities and they are experts at delegating. Some of the CEO responsibilities include setting the vision and goals for the company and making financial projections. As I read the article, I thought of three areas that CEOs succeed. CEOs must be able to pass projects off to their subordinates. They must also be able to trust the quality of work that they will produce. CEOs must be organized so they can make good use of their time. They don’t have time to waste doing things that aren’t important. They must be effective in everything they do so that they can stir the company in the right direction. CEOs must be able to execute. As they make decisions, they must be able to make things happen. When they make decisions in a meeting, they must have follow through to get things done. What are factors you have seen that lead to CEOs success? Please comment in the comment section below!